Goebbels smiled at him until he learned that Eisenstaedt was Jewish – a moment Eisenstaedt captured in this photo. Nazi propaganda minister Joseph Goebbels was cheerful and without a care when he first met photographer Alfed Eisenstaedt. In a close-up image the Third Reich politician was caught off guard smiling at the League of Nations meeting in Geneva in September 1933. But when Goebbels found out LIFE magazine photographer Eisenstaedt was Jewish his expression was quite different. Subsequently, when Eisenstaedt approached Goebbels for a candid portrait, the politician’s expression was very, very different. Instead of smiling, he scowled for the camera, and the famous photo that resulted shows the man wearing “eyes of hate”. His tense posture transmits an almost palpable enmity. I found him sitting alone at a folding table on the lawn of the hotel. I photographed him from a distance without him being aware of it. As documentary reportage, the picture may have some value: it suggests his aloofness. Later I found him at the same table surrounded by aides and bodyguards. Goebbels seemed so small, while his bodyguards were huge. I walked up close and photographed Goebbels. It was horrible. He looked up at me with an expression full of hate. The result, however, was a much stronger photograph. There is no substitute for close personal contact and involvement with a subject, no matter how unpleasant it may be. He looked at me with hateful eyes and waited for me to wither. But I didn’t wither. If I have a camera in my hand, I don’t know fear. But how did Goebbels found out that the photographer was Jewish? No one know for sure but maybe the surname is what gave it away and Eisenstädt is a distinctly Jewish surname. It’s entirely possible that Goebbels was told his name and drew the easy conclusion that he was Jewish or at least of Jewish heritage. A quote from Joseph Goebbels diary showing his hatred toward Jews: “The Jews are now being deported to the east. A fairly barbaric procedure, not to be described in any greater detail, is being used here, and not much more remains of the Jews themselves. In general, it can probably be established that 60 percent of them must be liquidated, while only 40 percent can be put to work […] A judgment is being carried out on the Jews which is barbaric, but fully deserved”. At first, Goebbels indulged Eisenstaedt with a few photographs, showing him in a much more pleasant, if not jovial mood. He looks evil, even when smiling. The contrast between those two photos is striking. How at ease he is in the smiling one and relaxed; then he is rigid and cold in the other one. I think the photographer created his own anti-semitism here. As they said, how would that guy even know that the photographer was Jewish? I think it's more of a "celebrity" stance. You see the same from modern celebrities. They smile for the camera for one or two shots, but eventually scowl. I think he did the same with a "What the hell? This guy again? Haven't you gotten enough pictures?" Everything is perception. The photographer perceived what he wanted to. Excellent point, Damiuss, never thought of it that way. Still in the end the picture is just as powerful either way. Yeah, because it's not like Gobbles was antisemitic and a prime leader of the Nazi party or anything. Nope, the photographer made it up. Couldn't in any way be possible that he was showing his true feelings through his expressions once finding out his photographer was Jewish, not at all. That is totally outside the realm of possibility. By all means, let's cut the Nazi some slack. Nice casual racism you got there. People like you are bloody dangerous. We appreciate your demonstration of ignorance and foolish thinking, Damiuss. There's nothing quite like a person who is willing to blindly excuse away evil in its purest form. While you're probably right about today's movie stars and paparazzi, this situation has neither. Agreed. Same conclusion drawn here. Had the photgrapher a better answer as to how exactly Herr Goebbels had become aware of his being Jewish, perhaps. TO ME, there appears to be a self-victimising narrative at play; however plausible, unlikely. That Goebbels was indeed a perverted anti-semite doesnt question the fact that it seems quite unrealistic that, in that moment when the photographer is right in front of him, someone came by and told Goebbels that the photographer is jewish (where does he know in the first place?) and the photographer thinks: "I'll better make a picture of this.". Don't get me wrong, it could have happened but the chances are higher that someone just made up the story to that picture afterwards, based on the things we know about Goebbels. Goebbels was a Jewish-looking, short, club-footed weakling . . . it's a surprise he didn't find himself having to wear a yellow star and face deportation to the camps. He does have some typical symetic features. There were some Jewish people back then who changed their names and joined the Nazis like George Sorros formerly known as George Schwartz, who joined Hitlers youth and went around with the Nazis ransacking the homes of Jews who were sent off to the ghettos. who know what he was thinking. so much assumption. The man is genuine, restful, and intelligent. He was absolutely correct in his warning, that: "Should the Jews win this war, the world will be plunged into barbarism". He was right. Because the world wasn't already barbaric before, nor what the Nazi party did before the wars end wasn't barbaric, right? Please, that just is a weak excuse to justify your not-so-subtle disgusting antisemitism. You are correct. There is a reason why they have been hated for thousands of years. Not sure if you're trolling or genuinely that ignorant and hateful. I think "TCS" and Olivia need to both visit a couple of the Death Camps/Concentration Camps to see who the actual barbarians are. Or wait, let me guess, in your worldview those things are all "staged," right? *eyeroll* Prejudice, ignorance, and hatred are the CAUSE of the problem, not the SOLUTION (see what I did there?). The photographer is jewish, how can we believe his story? I met the photographer in person and he gave the audience a slideshow of some of his most famous photos, including this one. He said he was shooting quite a few photos and then suddenly looked again at Goebbels and saw the profound "evil in his eyes" like he had never seen before. Brilliant man. Never trust a jew. 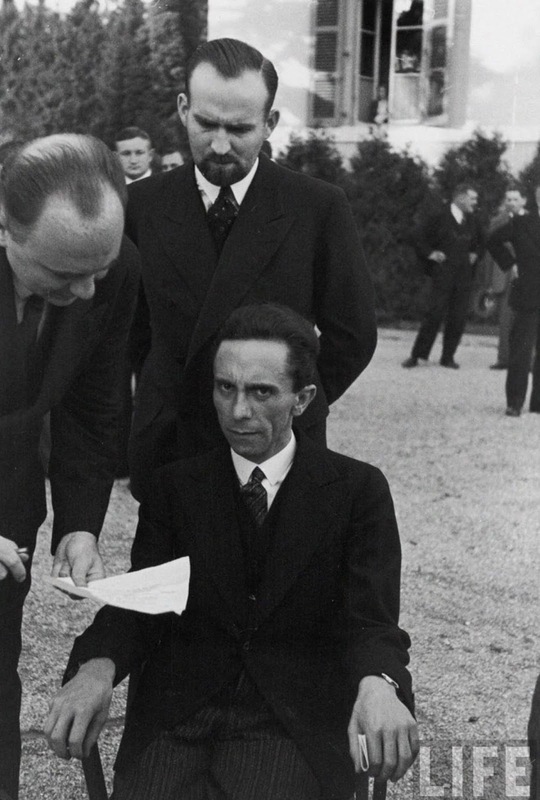 At a casual glance, it looks as if Goebbels was deep in discussion with people only to be rudely interrupted by a photographer possibly without getting prior permission. During the National Socialist regime, it was well known that all propaganda including photographs, recordings, films - everything, was carefully reviewed prior to it being released internally and externally. 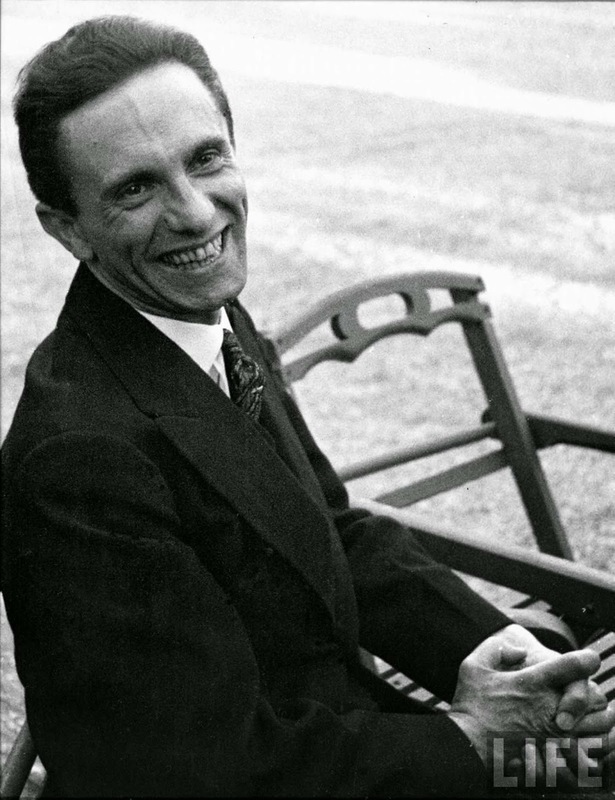 Perhaps Goebbels did not appreciate being photographed by someone he would have assumed to be American, for the foreign press and in such a candid way. Any politician, regardless of political persuasion does not like to be snapped by cheap paparazzi types who usually add their own captions and sitrep. Anyone could make up the "Evil Dr Goebbels" persona from that photo, even a child. The fact he wasn't exactly Errol Flynn doesn't help his cause either and would quickly sway the unassuming observer. I really can't see those "evil evils" the jew speaks of. From the scenario itself, it seems Goebbels was interrupted by an annoying photographer taking photos at the wrong time. But alas, people see what they want, and the narrative is written by the victors in the end. Joseph Goebbels was a true hero. Find time to read his diaries and you will find he is not what the propaganda made him out to be. I still don't understand how you can look at someone and ses that they are Jewish, I'm glad that I've never understood that and I hope I never do. That's the same look I give strangers when they approach me out of the blue while my aids are handing me paperwork. It's a look that says "What are you thinking, I'm in the middle of something vastly more important that whatever nonsense you're bothering me with, have you no manners? have you no class? Get your camera out of my face because I give you a colonoscopy with it. Begone, degenerate, begone narcissist who thinks his photo is worth my interruption from my task at hand"
Goebbels may have seen Eisenstaedt's name on what appears to be a LIFE magazine by him. He may have browsed through it. The name is the way he found out. I really believe that. Maybe someone else there knew it and told him.